Recycled plastic planters with a clean straight forward design available in both square and rectangular shape dimensions. Environmentally responsible construction from the finest recycled plastic, these planters will provide quality and longevity in any setting. 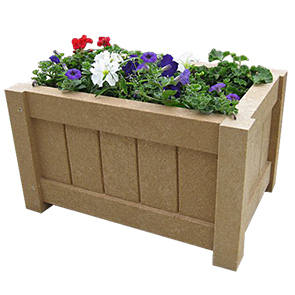 Requiring no maintenance, these planters are guaranteed not to crumble, deteriorate or rot. Available in the color options as shown the color is molded-in so these planters will never need painting.